This object allows you to access current prevailing scale structure from the MPG network and choose pitches based on their position within the scale. inlet 1 - An integer representing the index within the overall scale. 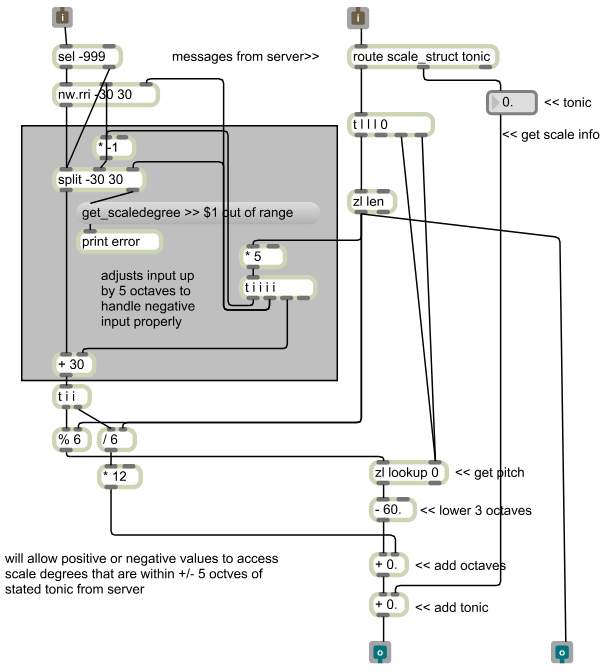 The scale structure array contains values representing the number of half-steps above tonic for a given scale degree. When a 0 is received, the array looks for the value at the 0th position in the array, combines it with the tonic and outputs the proper MIDI pitch value. The array is mapped over a 10 octave (+5/-5) range so that register shifts are easily used. 0 represents the tonic as assigned by the network. Negative values access octaves below the tonic, while positive values access octaves above. The value of -999 is reserved to access a random value with the 10 octave range. 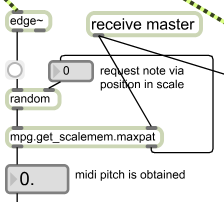 inlet 2 - Musical structure messages sent from the master via the musiclinks object. You will very likely get erroneous data until messages have been received here. The "scale_struct" and "tonic" messages are the only messages used.